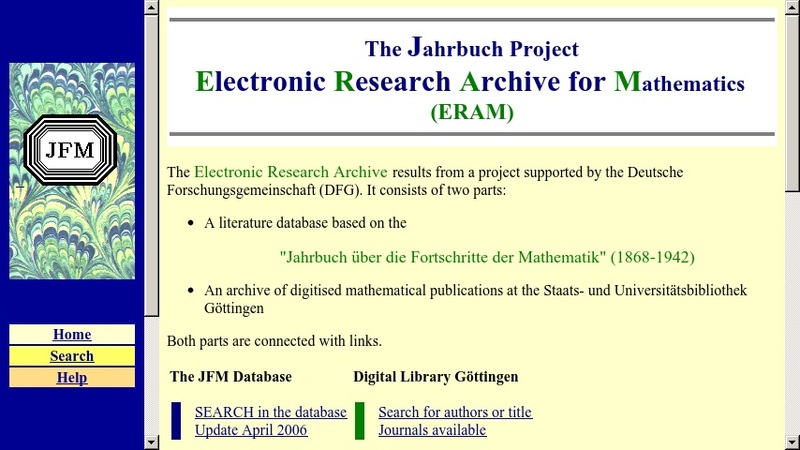 Jahrbuch Project has compiled this Electronic Research Archives for Mathematics that includes "the most important mathematical publications of the period 1868-1942 and a database based on the 'Jahrbuch Ã¼ber die Fortschritte der Mathematik'" or JFM. The project's directors have posted articles of JFM, which was founded in 1868 by the mathematicians Carl Ohrtmann and Felix MÃ¼ller, because they are "still valuable sources for mathematical research and teaching." The website includes a project description along with a fully searchable database. The articles are in multiple languages, including English, German, French, and Russian.